Ross Valley Fire Department is a JPA fire department that protects and serves three towns and an unincorporated zone in the Ross Valley of Marin County. Ross Valley Fire Department’s responsibilities exceed just fighting fire. Because of the unique geography– deep ravines, steep inclines, narrow roads and lush growth– a large portion of Ross Valley Fire Department’s resources are dedicated to fire prevention. The Department’s Prevention Bureau focuses on upholding and enforcing private and commercial building standards and codes. The Prevention Bureau covers four different populations, with four different building standards and codes, four different submission and review procedures, and four different fee structures. Due to the technical and legal complexity of each property’s construction, one of the Department’s major activities is to act as subject-matter experts throughout the construction/remodel process: planning, building and approval. The RVFD wanted to see a decline in the number and length of inbound, process-oriented communications. I was brought in largely to help decrease the pressure on the Prevention Bureau staff by developing a product that would articulate and clarify the procedural steps for non-experts. The stakeholders for this project included the Fire Chief, Board of Directors and the Fire Inspector (subject-matter expert). The team I was working with on this project included two Fire Inspectors, an administrator with deep procedural knowledge and the Ross Valley Fire Department web designer. The first portion of the project was spent at Ross Valley Fire Department learning and understanding their current system. After gaining some familiarity with the procedures, I began interacting with the public: asking questions, identifying pain points, and articulating information gaps. How do the different user segments search for prevention information? At what point in the construction process are they searching? What are the most frequently used forms? Most frequent project types? In terms of the user needs, the earliest pain point was that the user base was largely confused with the procedural steps. From speaking to the many property owners and builders, it became clear that the information architecture of the project types/steps led to confusion among users, and constituted the bulk of the inbound requests for the Prevention Bureau hours. In terms of the stakeholder’s needs, the burden of addressing the overwhelming inquiries fell on the shoulders of a limited number of RVFD domain experts and manifested in the form of 45+ minute phone conversations and meetings. The status quo was neither sustainable from a business perspective nor convenient for the public. To address this first pain-point, I cataloged a system that reflected the most common path through the building process. I grouped project-specific details into phases: planning, building and fire. I used color and navigation to indicate a hierarchy and process to the dozens of project types and details. The second pain point was that users were overwhelmed by the level of detail within each project type. Because there are four different populations, each with their own jurisdictional regulations (either by town or county), cataloging and tracking the details proved to be immensely confusing to users. 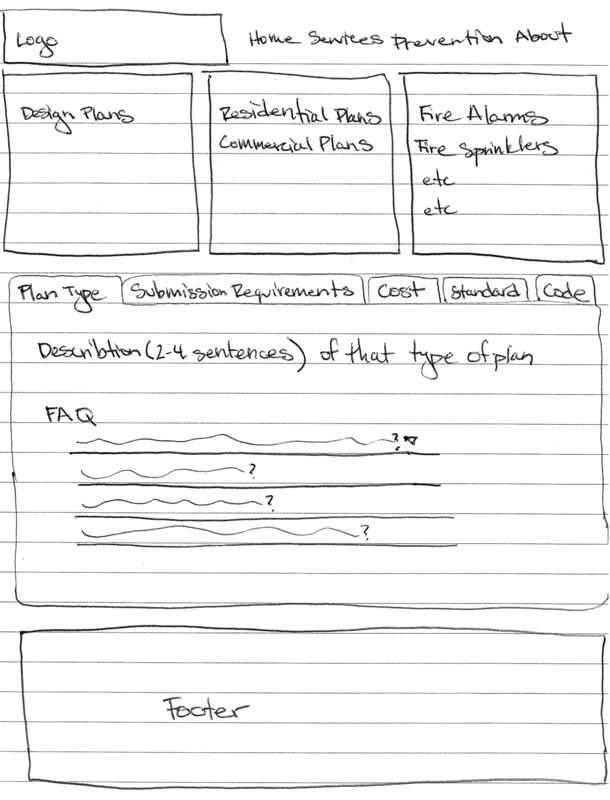 Early wireframe of the tab-system. Because I had created a hierarchy in project types, I wanted to develop a consistent convention in layout (mental model) to relieve the cognitive load for understanding the material. Every project type had a dedicated tab system which included: (1) an overview description, (2) standard and code links, (3) submission guidelines, (4) review process and (5) inspection requirements. By creating a consistent tabbing system, I reduced the cognitive load of moving through a massive amount of information. Third, I wanted to increase the visibility of the most-used documents to decrease the user’s frustration at needing to track down frequently used forms. I spent 30+ hours compiling common user questions, sourcing the answers, and translating the answers into plain language in the FAQ. The result was that the captains and fire inspectors were able to save time by referring users to the FAQ. Fourth, I reduced administrative hours by converting paper-based forms and files (for hazard complaints and special events) into Google Forms. This conversion resulted in convenient self-serve opportunities for users and reduced admin time for RVFD staff. Project process for installing fire alarms in remodels and new construction. While the tab system addressed procedural confusion, it did not address jurisdictional confusion. While a resident of town A and town B would follow the same steps, the offices they would visit varied. To rectify this, I created a wireframe flowchart by town to lead the user to the appropriate office at each step. A fifth part of the project was born out of the qualitative data drawn from the website that indicated a large number of users access the site while on mobile. As a result I worked with the web designer to scale the website and prevention site to a mobile-friendly, responsive site. Once the mobile site was up and running, my stakeholders shifted my objectives away from testing and refining the prevention feature toward developing statistical and graphical reports for the imminent retirement of the Fire Chief. I worked on the 2012-2013 Annual Report until the conclusion of the project. The metric we were attempting to push was to reduce the number and length of phone calls and in-person meetings. In particular, decreasing the number of procedural, non-prevention related inquiries. A system for quantitatively tracking the inbound hours was judged too costly. Tracking the quantitative data was one aspect of the project I would have liked to have included in the project deliverables, but fell outside the scope of the project. However, the features were deemed a success by the stakeholders, the Fire Chief and Board of Directors. The additional features of the project not carried to completion included converting the permit flowchart into an interactive, by-town feature. The flow chart is currently a static wireframe, in the form of downloadable PDF. While the prevention project improved information and procedural accessibility, it was an MVP, and there are still continued opportunities for refinement. 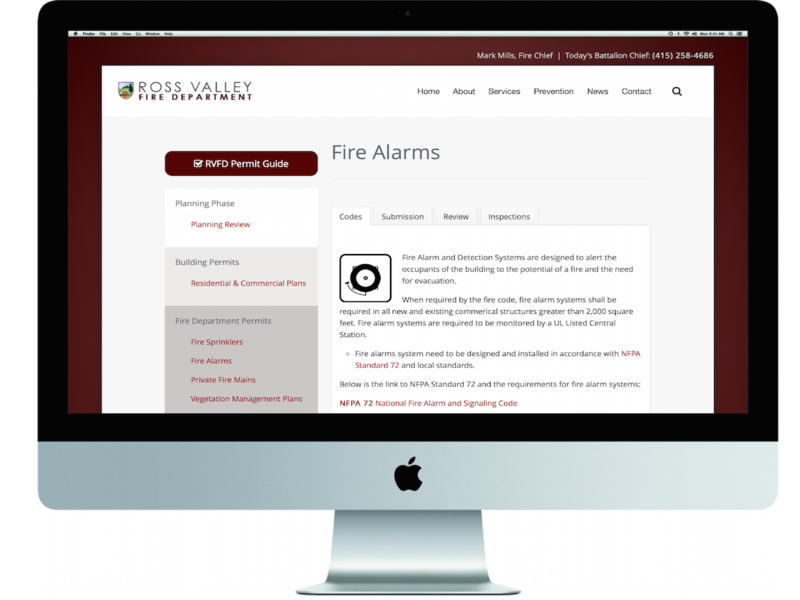 The goal is to continuously improve user engagement with the prevention site, thus decreasing the workload for Ross Valley Fire Department staff. Consistent messaging between the Fire Department and the different Town governances would additionally reduce user confusion and inbound questions.